"Jeff Regan: No Sad Clowns for Me"
Our vision of clowns comes from one of the most hallowed traditions of the circus. The modern circus was invented when Philip Astley opened his riding school in London, 1768. Astley invented the circus ring, a 42-foot circle in which the performer would ride, meaning the rider could take advantage of centrifugal force for his tricks, and performing in the ring meant he was always in view of the crowd. Astley's school featured equestrian training in the morning, but the real money was made in the afternoons and early evening when people came to see Astley and his students perform. As he grew as a showman, Astley realized that he needed something to keep the audience interested between the equestrian acts, so he hired clowns as a filler. The roots of the clown go back to Greek and Roman comedies in the character of the rustic fool or buffoon. The English term "clown", referring to a boorish rustic peasant first appeared around 1560, and may be derived from a Scandinavian word meaning clumsy. "The Harlequin and the Clown" became an important part of early English drama. Many clowns are mute, or perform in mime, but when Astley began using clowns in his circus they would often use dialogue and interact with the audience. It was only when circus venues grew to the point that people in the back of the crowd had trouble hearing the jokes that pantomime became an important tool for clowns. This is also the source of clowns using makeup to exaggerate their features. The white-faced clown is considered the top of the clown hierarchy, and in a troupe of clowns the white-face is usually the "top banana" and often works as the straight man. The auguste or red-faced clown is usually the most dimwitted of the troupe, and therefore the most likely to get a pie in the face. A character clown usually lampoons a role which will be familiar to the audience, like a policeman, a housewife, a butcher, or a hobo. The character clown may act as a second auguste or they may be the more cunning character who sets up a gag for the rest of the troupe. In American circuses, the most common character clown is the hobo, and many authorities consider the hobo to be their own separate class of clown. Emmett Kelly was a pioneering hobo clown, but Red Skelton, Charlie Chaplin, and Harold Lloyd are all noted hobo clowns from the movies. 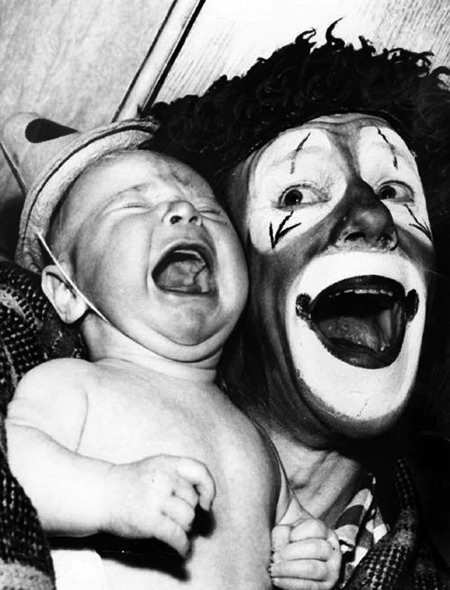 Although clowns were developed to make us laugh, there is a psychiatric term, coulrophobia, for the fear of clowns. Some folks, especially youngsters, find clowns in their makeup to be almost lifelike enough to be comforting, but often just exaggerated enough to be frightening. These fears have given rise to the evil clown persona. 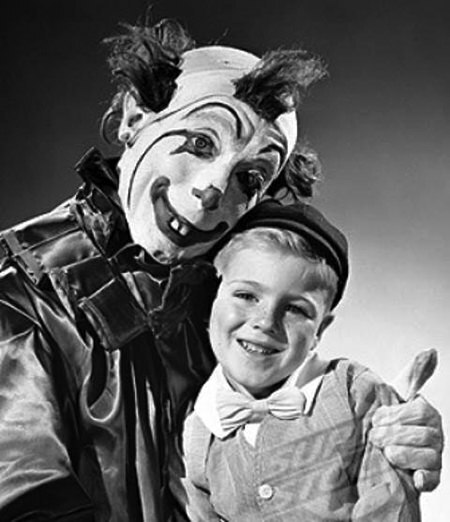 While certainly not part of the circus tradition, where clowns are allowed to be mischievous but not evil, the evil clown had been great fodder for detective stories on Old Time Radio. The misunderstood clown is also used as a sympathetic character in a number of stories. Clowns perform important roles in a circus performance beyond their comic routines. They perform bits of business between acts to provide continuity and distract the audience while the equipment is being set for the next act. One of the most notable clown jobs is "The Stars and Stripes Forever Bit", or "The Disaster March". By tradition, circus bands never play the Sousa march unless there is an emergency. Should a performer be injured during their act, the bandleader strikes up Stars and Stripes Forever and the clowns come rushing in to attract attention to the other side of the ring so that the injury can be tended. During the Hartford Circus Fire of 1944, the Barnum and Bailey Big Top, which had been waterproofed using a mixture of paraffin wax and gasoline, caught fire. 168 people from the crowd of nearly 7000 died, but the figure would have been higher if not for the efforts of the clowns to calm the crowd and help them to get outside. This compilation contains clown-themed broadcasts including shows from the childrens programs, detective broadcasts, comedy and variety shows, and much more! Be the first to comment on "Clowns in OTR"